Is the Snowshoe the Right Cat Breed for You? Is the Snowshoe right for you? Take a little Siamese and add a dash of American Shorthair, and you get the uniquely patterned Snowshoe. To the undiscerning eye, the Snowshoe may appear to be a Siamese, albeit of the traditional type, without the extreme features that are popular today. With beautiful, dark points and captivating blue eyes, this Siamese-off shoot is indeed very similar to its parent breed. However, the Snowshoe distinguishes itself by its pristinely white feet (hence the name) and harlequin mask. The Snowshoe is the Siamese with a much more liberal dress code! The American Shorthair left its own mark on the Snowshoe, not only mellowing the extremes of the Siamese’s physical features, but also many of the more extreme personality traits. Except your Snowshoe to talk, and talk frequently, but in tones just a little bit sweeter. Social and affectionate, the Snowshoe is your happy companion, but maybe a little less demanding than the self-assured Siamese. Still, the Snowshoe is a people-loving cat and thrives on love and interaction: this isn’t the breed for the casual cat owner or someone without the time to spare. The Snowshoe takes on many of the traits of the traditional or apple-headed Siamese, and moderates them a little further with some features of the American Shorthair. The body is muscular but not bulky, somewhat long, with a medium frame size and moderate proportions. The legs are long and strong, not delicate, with proportional feet, and the tail is moderate in length, with a gradual taper. 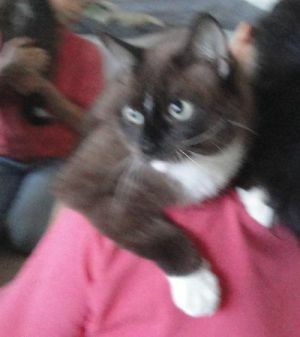 The Snowshoe’s neck is not quite as short and stocky as an American Shorthair’s, but nor is it long and delicate like a Siamese – it appears well in proportion to the rest of the medium-sized body. Like the traditional Siamese, the Snowshoe’s head is a broad, modified wedge with gentle contours. The cheekbones are somewhat high-set, the muzzle proportional to head size, neither broad nor pointed. The nose is of medium width, and has only a very slight dip from brow to tip. The ears are proportional to the body with rounded tips. The Snowshoe’s eyes are generally oval-shaped, greater in length than width but varying in roundness. Like the Siamese, the Snowshoe is known for beautiful blues which can range from a brilliant sapphire to a more faded blue-grey. Like the Siamese, they may also experienced crossed-eyes. Coat color is a defining characteristic of the Snowshoe. The fur is short to medium-short, smooth lying but somewhat dense. They are pointed, like the Siamese, but with some very specific differences. The Snowshoe may be solid point, tortoiseshell point, tabby point, or silver/smoke point with white features. True to their name, and regardless of coloration, the Snowshoe will have white paws. The Snowshoe’s two patterns are described as mitted and bicolor. A mitted Snowshoe has white paws, and may also have white on the back, legs, chest, and chin. Typically a mitted Snowshoe will be no more than 25% white. A bicolor Snowshoe will have white facial patterning and a greater variety of markings, with both patches of pigmentation and white occurring across the body. A bicolor Snowshoe is generally 25% to 50% white. The Snowshoe’s personality is an interesting mix of traits inherited from the Siamese and the American Shorthair. Smart, attentive, and somewhat mellow, they are generally easy to live with. They are not as “clingy” as a Siamese, but they still have a high need for affection and interaction. They are very loving, and you can expect to enjoy their company throughout the day, supervising your activities. They’ve inherited a little chattiness from the Siamese, so you may find your Snowshoe to be a little bossy: however, the Snowshoe’s voice is generally described as soft and melodic. The clever Snowshoe will pick up tricks easily, and may teach themselves to get into cupboard and doors. Some Snowshoe enthusiasts have even had luck teaching their Snowshoe’s to run a feline agility course! The Snowshoe’s favorite activity will be anything that allows them to spend more one-on-one time with you. You should only choose a Snowshoe if you enjoy spending time with your cat. 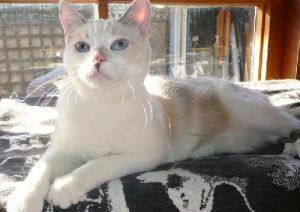 Sweet-tempered and playful, the Snowshoe may do well with polite children who enjoy indulging her with games and tricks. Many do very well in multi-pet households, but others prefer not to have to compete for your attention. This moustached kitty cat was a wonderful companion that was always asking for attention with her kind meows. While we lost this girl to a mean neighbor, we had 3 long years of playful cuddles, inquisitive meows and sits on chests. Shoeshoes are a breed known for their limp bodies, similar to rag dolls, making for a purfect cuddling companion! Marie had a loud meow and always let it ring when she was on the other side of a closed door. Early on, there were some issues with her using the litter box, we would find really wet kitten piles behind furniture and in piles of clothes, and it would get matted in her fur. Her unique markings and personality made her a cat I will never forget. I would recommend a snowshoe cat to anyone willing to put in a bit of maintenance for a whole lot of love..